With Children's Worship Bulletins, it's easy to engage your entire Sunday school classroom in relevant, fun and interactive activities. In this brief article, we've provided two examples of Sunday school activities created using the bulletins. Use one or both in your next Sunday school class! Have photocopies of each of the five hidden items (i.e., necklace, sceptre, treasure chest, ring and head covering) from the "Esther saves her people" puzzle, each enlarged to approximately 8-½" by 11"
Before the children arrive for class, hide each of the photocopies in the classroom. Have the children complete the "Esther saves her people" puzzle in the bulletin. When everyone has finished, tell them, "You did a great job of finding all the missing items in your bulletin! Do you think that you can find them again? I've hidden pictures of all five of those missing items here in our classroom. When I yell, 'GO!' see if you can find them." Yell, "GO!" and wait for the children to find all five photocopies. Give prizes to each of the children who found one of the photocopies. Sunday school activity about Esther for ages 7-12: What happened next? Give each child a bulletin, a pair of scissors, a glue stick and a booklet. Have the children complete the, "What happened next?" puzzle in the bulletin. Instruct the children to write and illustrate their own booklet. "Now that you've solved the puzzle, we're going to make our own booklets of this story. First, make a cover for your booklet by writing a title of your choice for this story on the first page. Include our Scripture reference, Esther 3:1-15 and 9:1-18. Cut out the first picture from the bulletin and glue it to the first page inside your booklet. Above the picture, write the part of the story that corresponds to the picture. Write the second part of the story, corresponding to the second picture from the puzzle, at the top of the next page. Cut out and glue the picture from the bulletin into your booklet. Continue with the rest of the story, writing each part of the story and gluing its corresponding picture from the bulletin into the remaining pages of your booklet. Allow the children to show their finished booklets to the rest of the class. 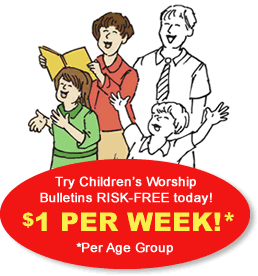 Children's Worship Bulletins are available for two age groups: ages 3-6 and ages 7-12. Bulletins for each age group are filled with age-appropriate codes, dot-to-dots, hidden pictures, mazes, puzzles, seek-and-finds, word games and more to keep all ages interested and engaged in Sunday school.